Harry, originally from London but a Helensburgh resident for some years, was presented with his medal by French Consul General Emmanuel Cocher on behalf of the President of France. 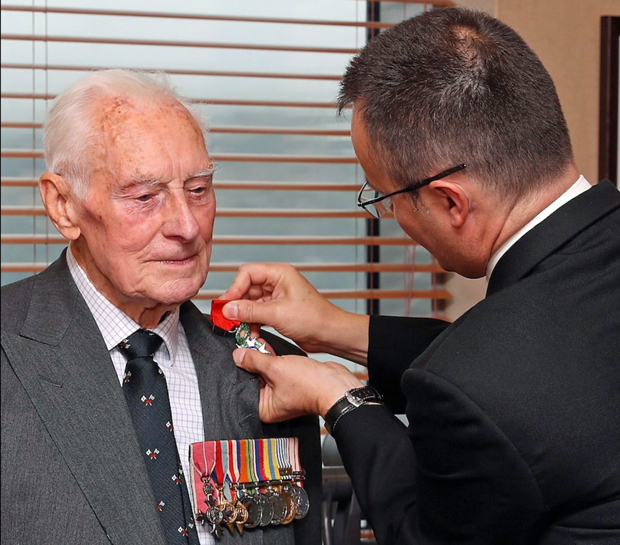 The French government is currently recognising the sacrifice of British service personnel who served during the D-Day operations, and around 5,000 medals have been awarded around the United Kingdom. There to witness the award were some of Harry’s family and friends, among them his daughter Lindsey and her husband Stuart who had travelled from Dunfermline. Harry joined the Royal Navy at 17, receiving basic naval training at Dartmouth and specialist engineering training at Devonport. His first deployment, as a Lieutenant, was on HMS Enterprise, a Light Cruiser, and the first five months were spent in working up for the forthcoming invasion. The honour conferred by the Consul General was specifically for Harry’s participation in the D-Day Landings. HMS Enterprise fired over 9,000 shells during the landings and the bombardment of Cherbourg, and had to retire briefly to Chatham Dockyard to have her worn-out gun barrels replaced and to refuel. Both the Captain and the First Lieutenant were wounded in the action while on the bridge. Harry said: “I remember waking at dawn on D-Day and going on deck to find the sea completely covered with ships and crafts of every conceivable shape, size and purpose, for as far as the eye could see, and mostly heading for the beaches. Harry left the navy as a Commander in 1971, joining the Royal Naval Engineering Service, an MoD civilian organisation in support of the navy. He spent ten years at HM Naval Base Clyde, where he finished his career, retiring in 1982 as chief services engineer at Faslane. Even in his early 90s he played tennis every week at Helensburgh Tennis Club. Andy Knox, Command Warrant Officer Submarines at the base, thanked Harry for his service at HMS Neptune and presented him with one of the few remaining HMS Neptune crests and a very special bottle of 18-year-old malt whisky.